“Our Future Foyle” is a transformative, innovative cultural and health intervention focused on the River Foyle in Derry/Londonderry. The project has been developed over the past two years through extensive community and stakeholder engagement. It aims to improve the health and social well-being of everyone using the riverfront of the River Foyle, through rejuvenation and animation of the banks and bridges as a shared positive space. The project is delivered in partnership with City Centre Initiative and a series of strategic partners from regional and local government. Vizrage has been involved from the very beginning, creating concept imagery, visualisations for media/print, and animations illustrating the vision of the Reeds and Bubbles on the Derry riverfront. It has been an ongoing collaborative effort with the team based out in Derry with more projects on the horizon! It was brilliant to hear that Halliday Clark Architect's proposal for a private residence in Yorkshire was featured in the Architect's Journal in June! Below is a snippet from the article. The practice, which is nearing completion on a new office in the town, says the home has been designed with its five bedrooms placed below the top-floor living spaces. This arrangement allows views across the valley to Ilkley Moor from the sitting room. 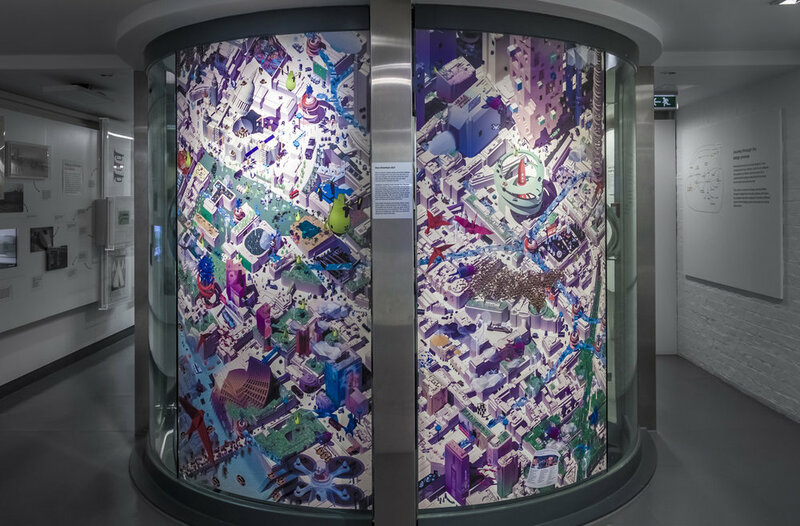 A collaborative illustration comprised of a 2 metre x 2 metre print, featured in the London Transport Museum, 2016. The project challenged the potential impact driveless vehicles might have on the City of London. Ultimately, with what looks to be a slightly dystopian and chaotic future.